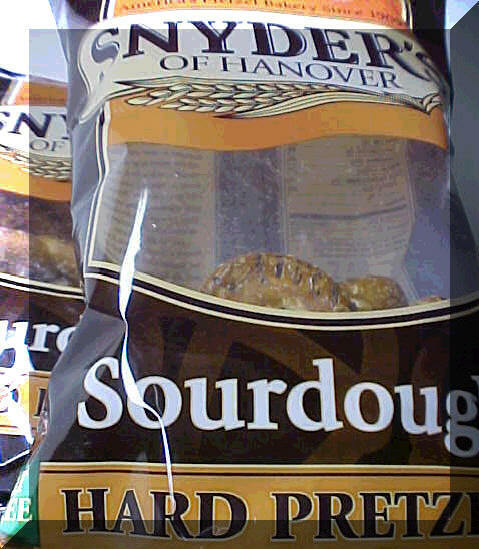 the front panel of the football-sized bag of sourdough pretzels in my hands. All I can see inside is the back of the bag, about four inches deep. like they are toasted Muppet characters ready to put on a show. the whole illusion of life. The clerk sees my bag and laughs nervously at the sight. The farmer's wife tells me that I should go and get myself another one. eight-ball. He sees the answer and tells me that I been screwed. The bagger volunteers to run back and get me a decent bag. I beg off. cellophane curtain and I can see clearly that the cupboard is bare. caught-up in the argument of half full or half empty. Too late indeed, mister twisted pretzel guy. Your crap is out of the bag. its is all just a great big half-crassed ploy! A con. We been had. No recourse. eye level in our friendly corner super store? Shelf life? No problem. Buyer beware. There is no small print. Tell me it isn't so. Ain't it a shame that it is in these sadly depleted sacks we trust?